There are many elements to take into account when creating a pricing page. From strategy to messaging and finally the design, each element has an active and important role in converting visitors into paying customers. Below I have divided the building of a pricing page into 2 main categories: The strategy and the design. Each part of the pricing page structure is important for increasing conversion rate. Take a look at the pricing page examples below to see what other businesses are doing, the good, the bad and how to fix it. If you’d like to enter our monthly round of landing page critiques and get optimization tips, send us an email to contact@conversioner.com with a link to your landing page. When it comes to our purchasing habits many different elements influence our decision making process. From evaluating the decision to be made, gathering the right information, identifying the options, weighing the alternatives and finally making a decision, many psychological triggers kick in and effect our final decision. There are many elements to take into consideration before the actual design. Before starting your design, list all the objections your potential buyers are likely to have to becoming a paying customer. This list will give you an idea of what you need to tackle on your pricing page, which elements should be emphasized on the page, and which removed. Knowing how much it costs to produce your product/service – How much does your product cost? what goes into it. 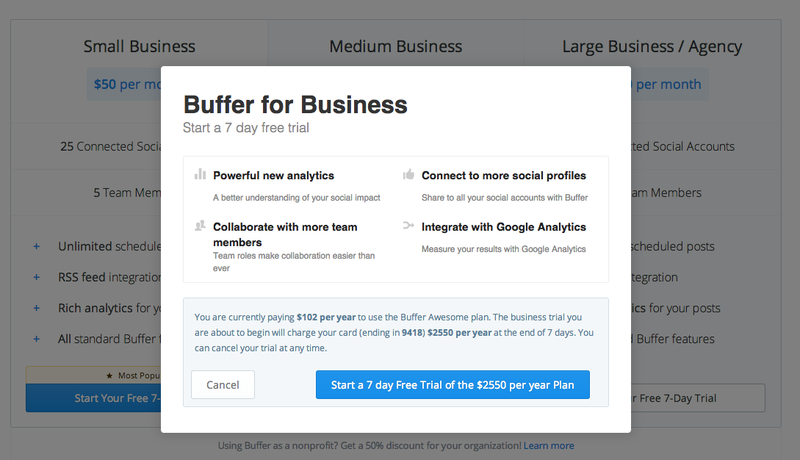 Check out Buffer’s pricing page example below to get an idea of how it’s done. Understanding your client’s willingness to pay – We tend to value our product or service at a much higher price than people are actually willing to pay for it, simply because it’s ours. How much will your customer be willing to pay? will they be willing to pay? and when? Moving on, the next step in your pricing page strategy is defining your messaging. Remember that customers are going to be looking for the “What’s in it for me” element. Focusing on your product or service rather than the outcome and bottom line for the customer. These two mistakes, especially the second one, plant worries in your customers mind before they’ve even had time to think of them. 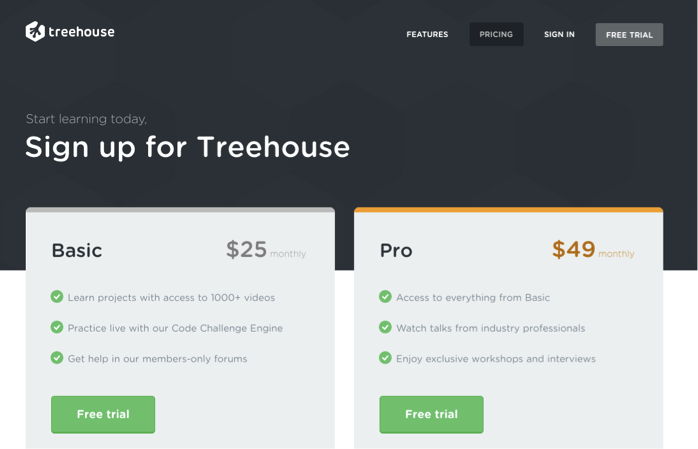 Treehouse fits in with the majority of companies who focus on the action, not the outcome – “Signup for Treehouse”. You have to read the fine print to understand what you gain. 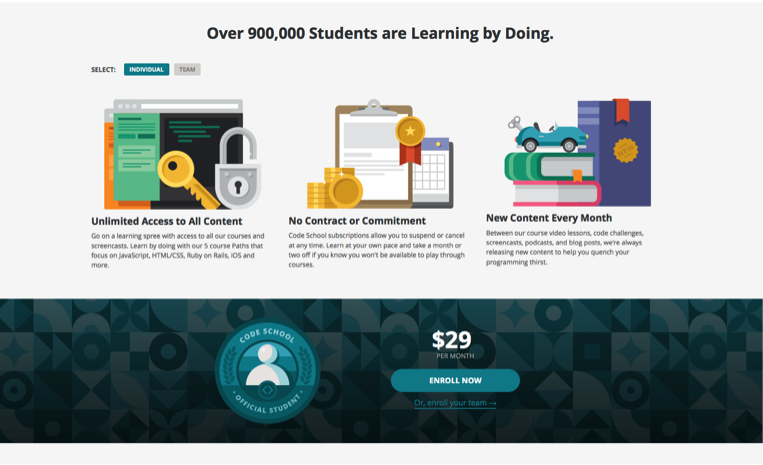 CodeSchool on the other hand focuses on the outcome: Learning by doing. They manage to emphasize that becoming a customer means you will learn to code and that 900,000 other people are doing it (which is a great way to communicate trust). The names of your pricing plans matter, by using meaningful names you can reduce customer frustration and direct them to a particular plan that’s good for them. 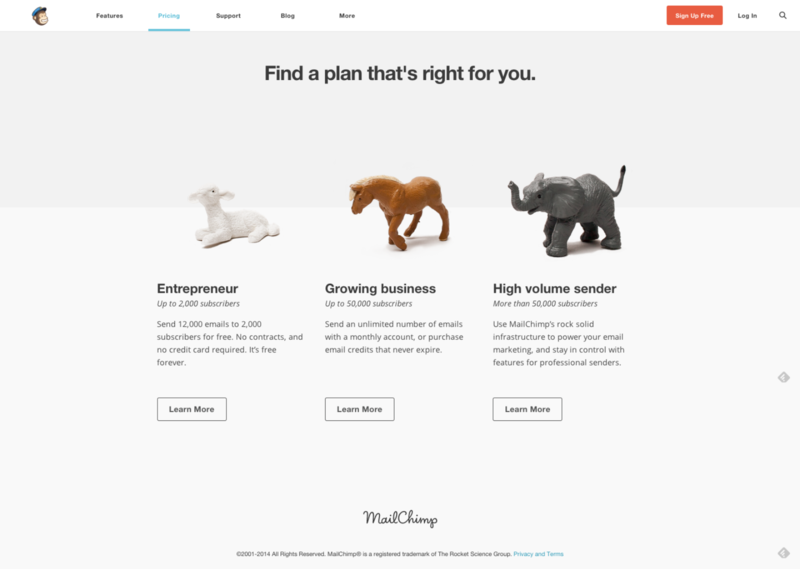 Mailchimp helps customers identify their needs and make a quicker decision. By distinguishing between entrepreneurs, growing businesses and high volume senders, customers know immediately where they fit in and can choose a plan quickly. There are many psychological triggers that effect our purchasing decisions, like Anchoring, analysis paralysis, the endowment effect and other cognitive biases that can be used in our pricing page design. 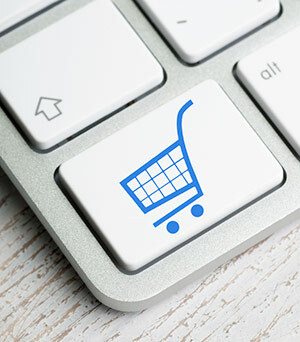 Using techniques such as free trials, specific plan sales and premium plans can increase conversion dramatically. Using psychological triggers brings us back to the basics: Recognize your customer’s emotional triggers, what will trigger them quickly and what is the best way to convince them to purchase your plan. Check out these 10 psychological triggers you can introduce in your design. The last and most important part of pricing page strategy is remembering to keep it simple and understandable. Don’t try to reinvent the wheel; don’t make it too complicated to understand. You want visitors to get the bottom line of your pricing page in a few seconds, recognize the right plan for them and choose it. Don’t over complicate it with text and new ideas. 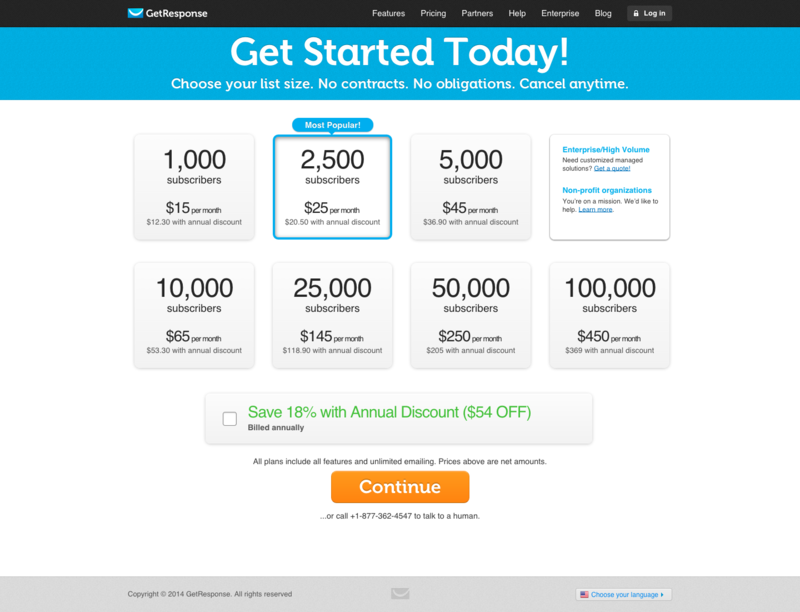 One thing you want to watch out for is the amount of text you use on your pricing pages. Many marketers try to add as much explanation as possible to their pricing page, essentially making it hard to read, pushing important and relevant information below the fold and making it hard for people to understand the page. Reduce the copy to a minimum, make sure to show only the most important content needed above the fold. For additional reading, add the rest of the information below the call to action button. Steer away from cluttered pricing pages. Similar to reducing your copy to a minimum, make sure your pricing page is easy to comprehend and analyze. People won’t read everything; they will skim through your proposals. Remember, people want to be navigated in the right direction, they want to know where to look and what to click, maintaining a clutter free pricing page will help them do that. 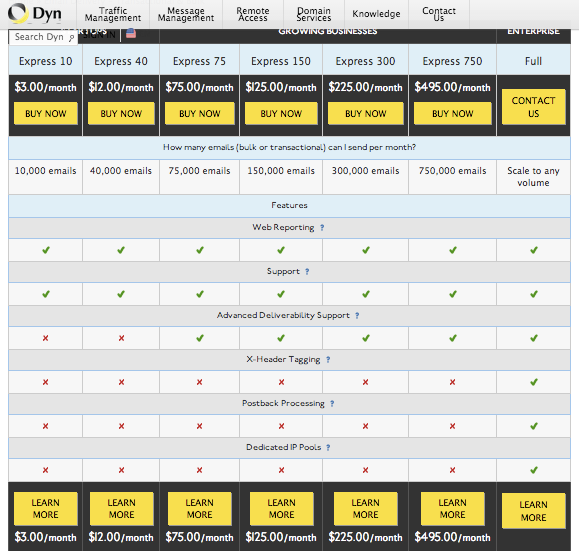 Checkout Dyn’s pricing page. What is going on here? 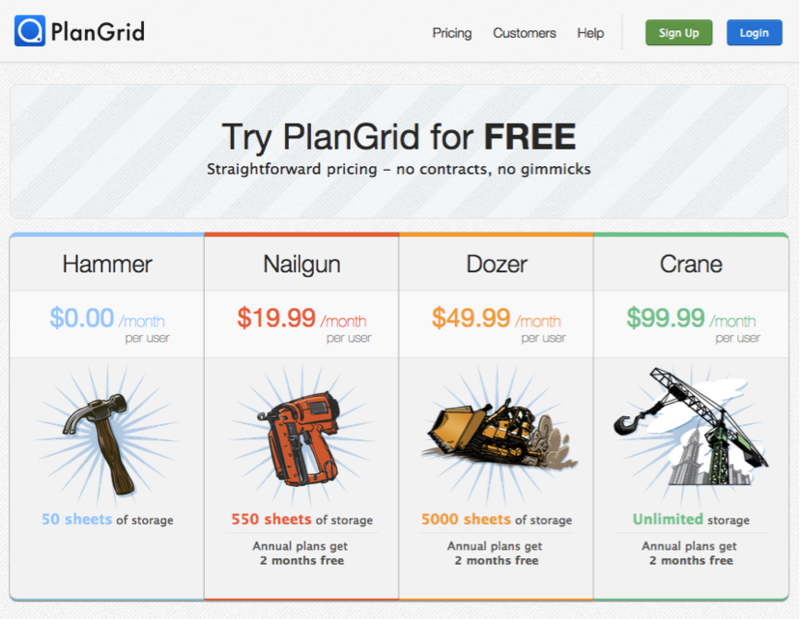 When building a pricing page you want to make sure it is easy to compare your offerings. Potential customers see dozens of offers a day and need to have an easy way to compare these offers. Creating a few optional plans and highlighting the differences between them helps not only in making it comparable but also in directing your customer towards the plan you want them to choose. Note how 3dCart makes it easy to compare their different plans and highlights the one plan they want customers to choose. This layout allows customers to quickly see the differences between the plans and choose the most relevant one for them. Use the “anchoring” technique – show a higher price first and a more affordable one next to it. It is best to set the higher price on the left hand side. Testimonials – show potential customers that you have many other happy and satisfied customers. Trust icons – show off your partnerships and security methods. Statista offers trust elements above the pricing plans in the shape of customer logos, emphasizing their many important clients and also uses additional known logos of companies who publish their data. 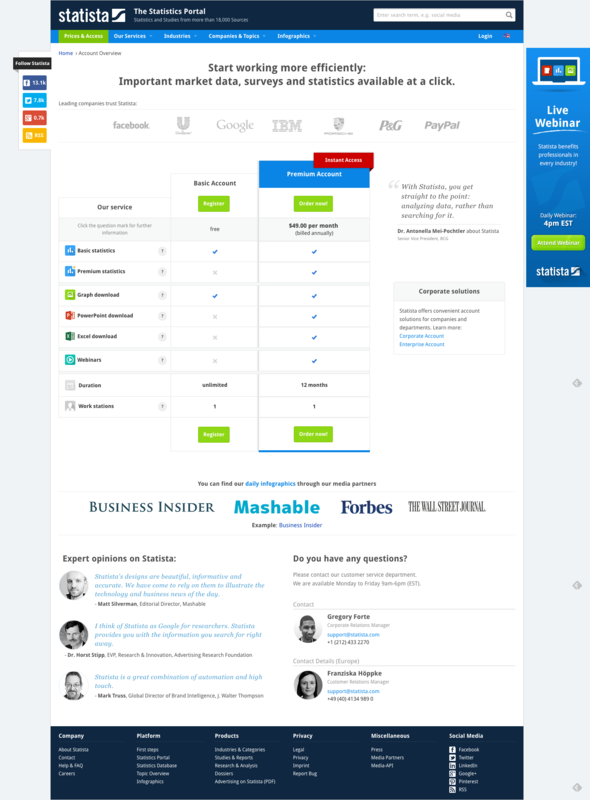 Additionally using testimonials below and next to the pricing plans, Statista presents their many satisfied customers. A great way to increase pricing page conversion rates is to show pricing currency according to the customer’s country. By offering an option to change to their own currency, customers will be able to compare plans easily without the need to convert pricing themselves. Too many pricing pages have their call to action buttons below the fold, basically making customers scroll in order to checkout. Your call to action should be visible to a visitor immediately and should also be the first natural place a visitor looks at. Make sure your call to action button stands out, and that no other elements overshadow it. Similar to the Dyn pricing page, remember that too many options can cause frustration and increase bounce rate. Use pricing plans so customers can compare and find the best plan for themselves but use the minimum brainpower needed. Try testing the number of plans you have. 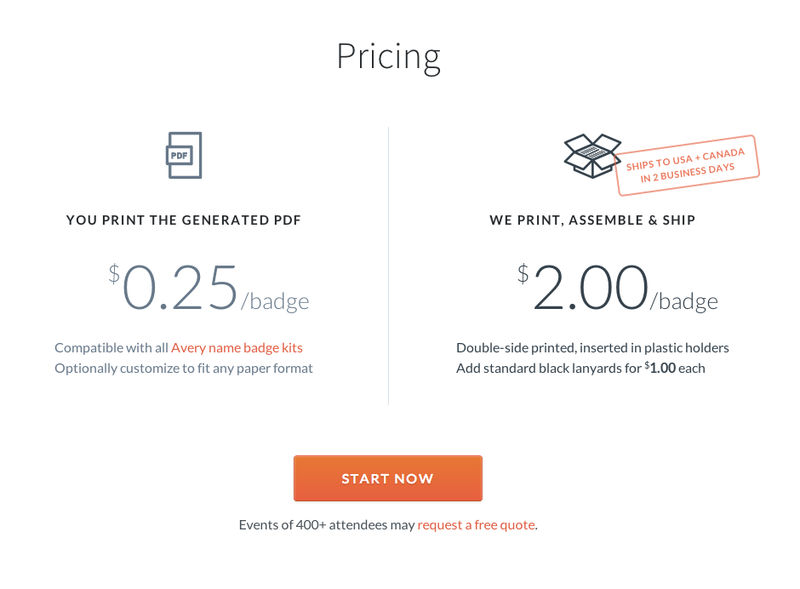 ‘Conference Badge’ uses two simple pricing plans to make it easy and quick for the customer to choose. “Choice supportive” is a term in psychology that recognizes our tendency to remember our choices as better than they might have actually been. When we look back on our purchase decisions we tend to rationalize the reasons we chose the way we did and feel satisfied with them. This is why a one time yearly payment is considered better than a recurring monthly payment that may make our customer reevaluate their purchase each month. Test yearly pricing plans vs. monthly pricing plans to discover what your customers prefer. 44 % of online consumers say that having questions answered by a live agent while in the middle of an online purchase is one of the most important features a website can offer. Chatters who engage via proactive invitation are 9.8x more likely to convert than visitors who don’t chat. There are many quick and easy chat plugins you can use on your pricing page. Definitely test some out (our current favorite is Zopim). The secret to any good pricing page or landing page is constant testing. There isn’t one best way to design a pricing page, everything needs to be tested and personalized for your customers. One thing that works for your competitor won’t necessarily work for you and vice versa, continue testing ideas and trying new modules on a monthly basis. This app for construction workers uses a few elements worth mentioning. Great pricing plan names that illustrate the type of plan you’re about to choose – from simple “hammering” for quick storage to the full blown “crane” offering unlimited storage. Their pricing plans are simple, easy to understand and are easy to compare. On the other hand, they’re missing one very important element – a Call To Action button. Though the plans are clickable, people need a call to action, a sense of direction directing them where to click. 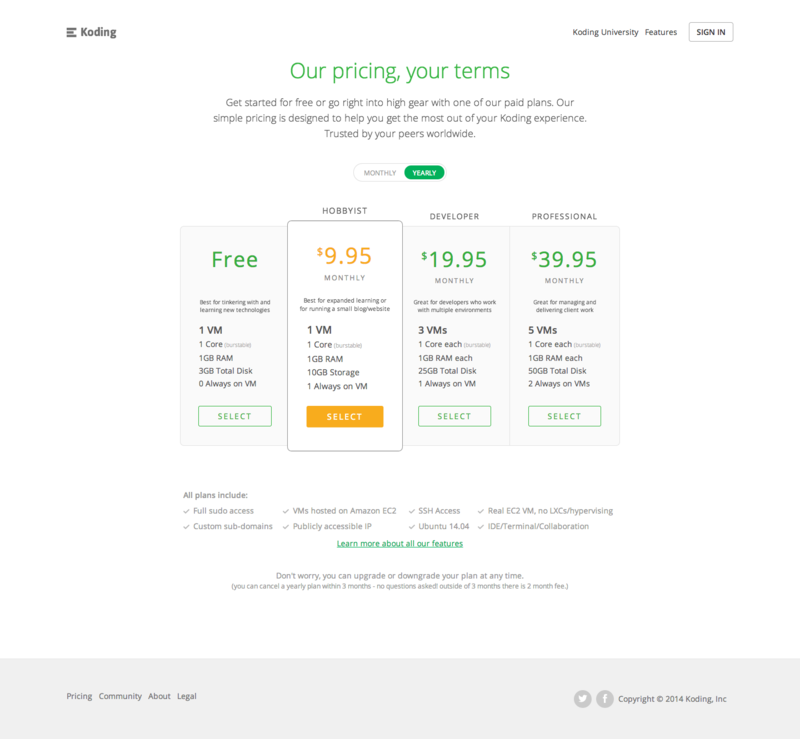 Koding’s pricing page is a great example of a clean and uncluttered pricing page. Great work on directing customers to a specific plan using the orange color. 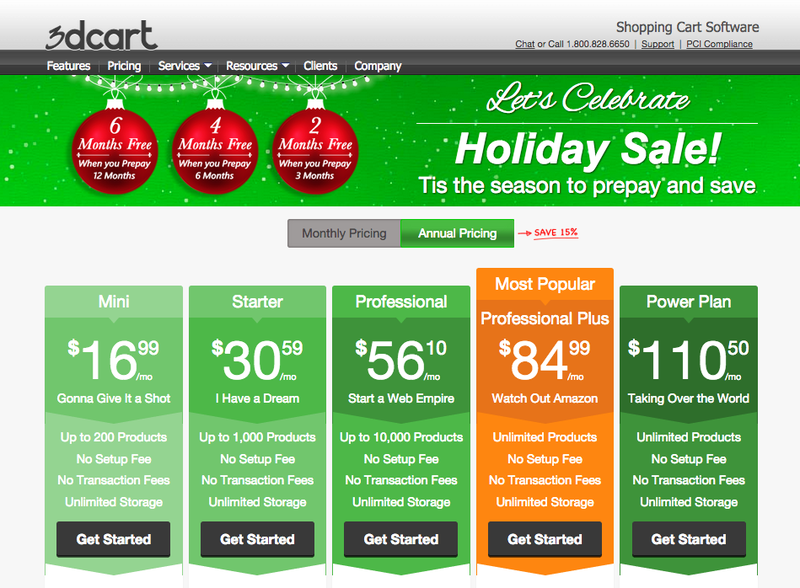 Another good thing to notice is their pricing is automatically set to a yearly plan. Unfortunately their call to action button is below the fold, and the plans themselves aren’t clickable so you have to scroll in order to convert. Similar to previous pricing page examples, remember that the call to action should be the first natural place a user looks to. Get Response has a different structured pricing page that what we’re used to seeing. They’ve pre-checked their favorable plan for the customer and do a nice job on emphasizing their chosen plan. Great banner for the yearly plan, I would however test pre-checking the box. The first issue is that once you’ve clicked on a plan, nothing happens. People are supposed to somehow understand they need to scroll to continue. Nice work on the clickable plans but people need actual call to action buttons. Stop warning people – no contract, no obligations, cancel anytime – companies can’t resist saying this on every pricing page but by using negative words they’re just putting ideas into people’s heads. Buffer is an extremely cool platform for managing your social accounts on. We’ve been using them for a few years now. The way their pricing page is setup shows that their emphasis is on getting people to first signup and only later convert them into paying customers. Their call to action is simple and easy to understand. Their pricing module is pretty simple to understand with 3 basic modules. The testimonials and trust icons introduced below the pricing plans are a great way to increase social proof. They recently added their “Transparent Pricing” which I think is a great way to explain the costs to a new customer. The fist issue they have is they don’t really highlight any specific plan. Even though one plan has a dominating call to action color, there is no real emphasis on one plan or another. One big issue is that once you choose a plan a pop comes up summarizing the total amount you’re going to pay once the trial is over. Until now, customers were ready for a certain amount on a monthly basis and suddenly the pricing jumps to a one-time payment. Comparable – Spotify makes it very easy to see the difference between their two pricing plans without even reading the fine print. The image of more devices without the ads paints a clear picture of what a customer gets by choosing to pay. Their premium offer is highlighted in a great way and clearly directs you to a certain plan. As the pricing page is on the main homepage and not on a separate page, less emphasis has been given to social proof & trust elements. I’d definitely test adding some to that part of the page. The pricing modules are extremely cluttered with a lot of text and color, it is very hard to understand which module is the right one without carefully analyzing each plan. Although they’ve added a “most popular” banner to one of the plans, it’s very hard to locate in the sea of information, text and color. The arrows indicating a “yearly” plan are alarming in the way that I have no idea what will happen if I click on them. Will I be sent to a payment page? Will everything change? It seems to me that the biggest difference between the plans is the amount of people who can answer your forms. In this case I would focus my pricing page on that. 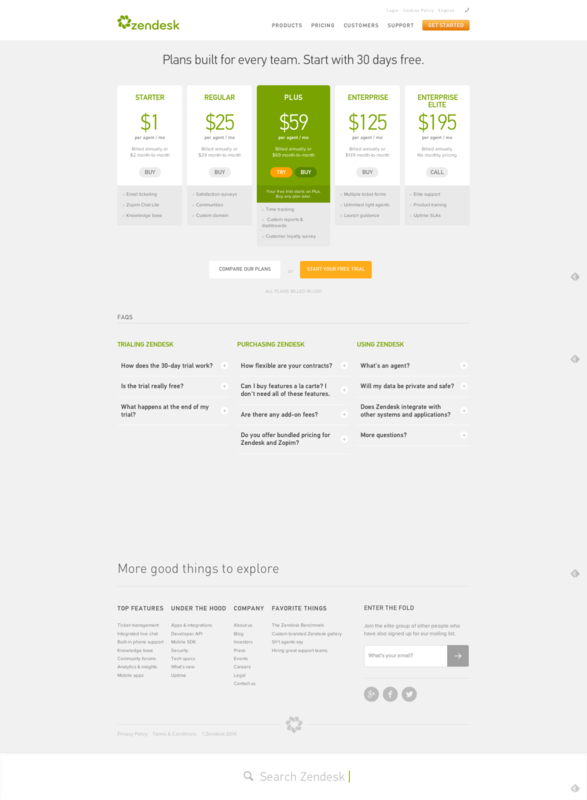 Zendesk has a clear and uncluttered pricing page that highlights a preferable plan. 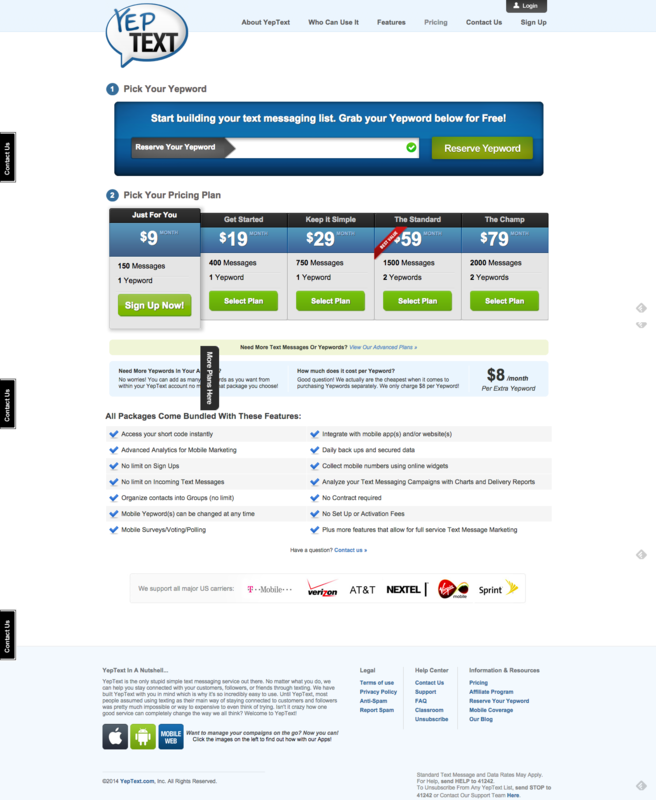 Their “Compare these plans” button is a great way of presenting relevant information below the fold without cluttering the main part of the pricing page. Two ‘call to action’ buttons is problematic, you either want people to try a free trial or become paying customers. Offering both options on each plan makes it confusing and will reduce conversion rates. I would definitely test this; you’d be surprised how many people would simply pay if they didn’t have the option to try. In addition to having two call to actions on their main plan, their call to action changes from plan to plan and isn’t consistent. Remember to give a consistent experience throughout the page so people can identify the call to action. Besides the good use of trust icons and social proof, the way this page is built is very interesting. In fact, their way of getting you started is making you first choose a keyword and only then a plan. The biggest issue here is that they’re highlighting 2 different plans. On one hand it says “Best Value” on the $59 plan, but on the other hand the $9 plan is highlighted and pre-chosen for the customer. It’s not really clear what would be the best choice. I’ve already mentioned these for a few of these pricing pages but as you can see they do a great job of using social proof (testimonials and trust icons) to ensure clients they’re in safe hands. They’re structure is good and easy to read. The fact they put their highest price on the left, ensures people will read it first and have that price set as an anchor. They’re not telling customers what to choose. People need direction and help in choosing the right plan. Litmus is missing a major part of their pricing page by not telling people what to choose. Another important element they’re missing is the use of annual plan vs. monthly. They actually have much better pricing for companies committing to a yearly plan, but don’t mention it anywhere. Unless you click on “annual” you don’t really know it’s worth it. There is no “one size fits all” solution; each pricing page should be tailored to its audience and tested regularly. Remember that a pricing page is the first place a customer puts their vote of confidence in you and your product or service. When designing a pricing page plan, make an experience your customer will remember and feel good about. Similar to landing pages, pricing pages should be optimized and tested on a regular basis. Great article Talia, a lot of these examples mentioned are great. I can’t wait to apply them in my own projects. Cheers! Thanks Shai. I’m glad you found the article useful! Thanks for posting this Talia, looks extremely useful and provides lots to think about. I’m sharing it on Twitter now. Thank you Rob, glad you found the article interesting and thanks for sharing! Great post. Really wish I’d had this about 2 months ago when we were redesigning the pricing page for Foundersuite (and made a ton of simple mistakes! I think we are now hitting most of your points, but could always improve of course. Love the Litmus and Zendesk pages. Hey Nathan! Thanks for the feedback I’d love to hear more about your pricing page process, the changes you’ve made and how it’s going!